When most people think of Australia, they picture golden beaches, blue skies and the Sydney Harbor Bridge. But for those Aussies like me who live at the southern end of the country – life is a lot more varied than that. In Melbourne, down the bottom of Australia, we have four distinct seasons: Summer, Autumn, Winter and Spring. We go from 40 + degrees Celsius in Summer all the way down to crisp four degree days in Winter. Weather tends to dominate a lot of our conversations – and most of the time we’re either complaining it’s too hot or too cold. But would I swap our seasons for a life of constant warm days? Probably not. Seasons give a nice rhythm to life… with plenty of positives to outweigh the negatives. Right now, we’re suffering through frosty Winter mornings and icy evenings. But I’m loving the freedom to get into my flannelette Pyjamas as soon as I get home from work. And I’m spending my evenings learning how to knit and crotchet while curled up in front of a good movie. There’s something about rainy days that seems to justify taking things a bit easy. 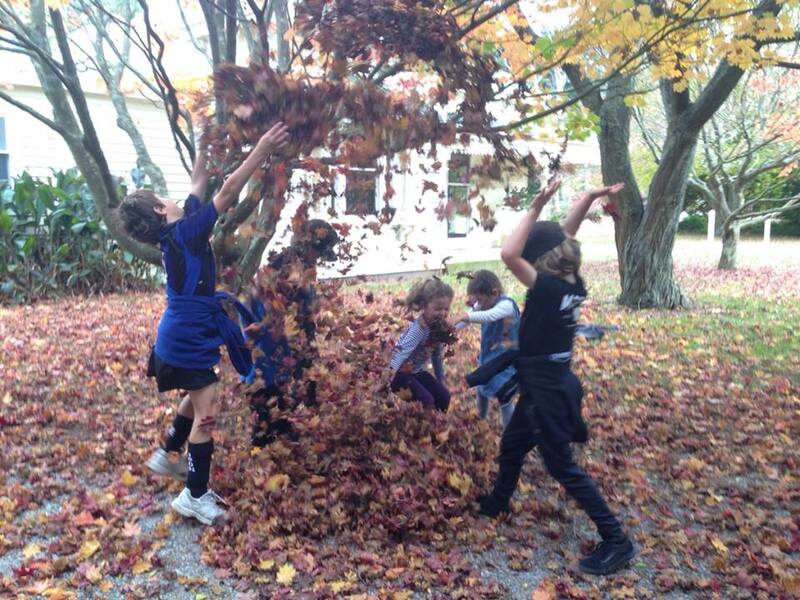 Watching my kids playing in piles of leaves with their cousin (below), I started thinking about how the seasons are a good metaphor for my moods. Autumn reminds me of anxiety and the first signs of depression. There’s a sense that – despite the lovely weather – there’s bleak times ahead. Like the leaves falling off the trees, there’s an impending feeling of gloom – like things are about to fall apart. I need to force myself to look around and see the beauty that’s still there… in the colour of the leaves, in the people who care for me. Winter’s cold, dark, bleary days remind me of the dark pit of depression. No matter how hard you try to wish it into being, there’s a lack of sunshine – or joy – and you crave warmth and comfort. But like the bare branches – not dead but merely dormant – there is still life within me. I just need to get through this season. Coming out of a depression, is a bit like defrosting after a long Winter. New buds appear on branches – just as tiny shoots of joy and hope start to appear in my life. I look around and notice life again – feeling for the first time in a long time that I want to spend time enjoying my friends and family. Happiness has crept up on me… bringing a smile to my face again and making me – like the trees around me – fruitful again. Mania is hard to describe, but if I was to liken it to a season it would have to be the long, energetic, fun-filled days of Summer. Just like I’m often taken by surprise with a nasty sunburn while having fun on the beach, so to mania is something that creeps up… disguised by seemingly endless energy and ideas. And I end up needing protection and help to get through this season. Living with mental illness, I’ve learnt that I need to be prepared for all seasons. I wouldn’t venture out into the blazing sun without a hat – or the snow without some gloves. So I can’t expect myself to face the ups and downs that come with bipolar without some form of protection – in my case, medication. Coming to terms with this – and acknowledging it – frees me up to get on with living life. There will be ups, and there will be downs, but life will move on – and each season will soon pass. Do the seasons have an impact on your mental health? If so, what do you do about it? Would love to hear! Considering I’ve just spent the last 14 days lazing around the pool and reading books on the beach during our family holiday, he’s probably right. There’s something about camping that forces you to slow down. Without TV or electric lights, I’ve been going to bed a lot earlier than usual. 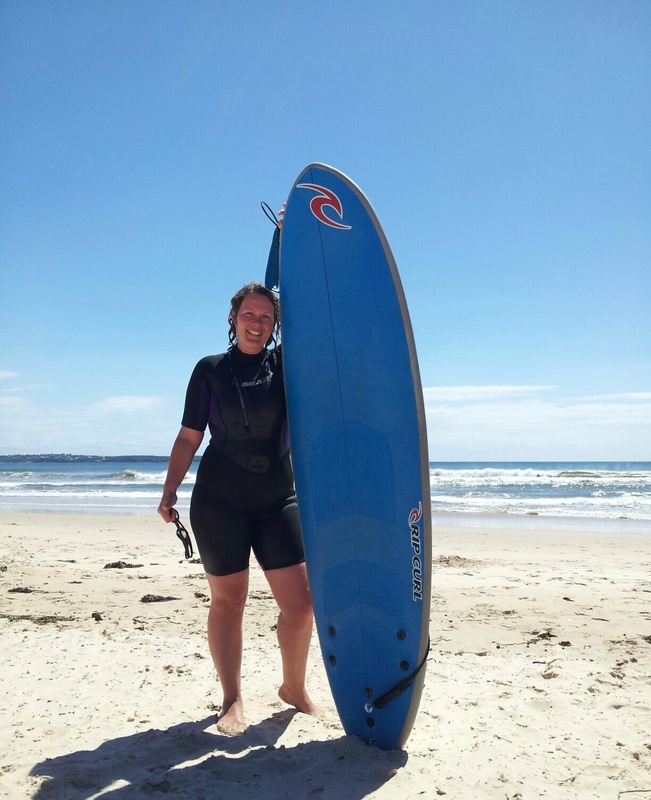 And away from my desk, the pressures of work seem to have melted away… giving way to a new rhythm of breakfast, swimming at the beach, lunch, swimming in the pool, chatting with family over a BBQ dinner and then reading a novel in our cozy tent. Yet, every now and then my tendency to overdo things slips through the cracks. 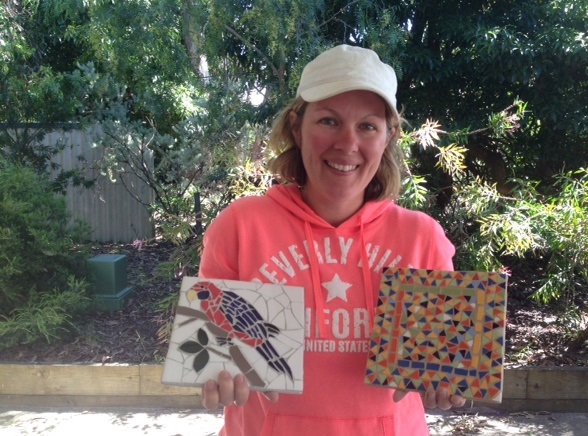 Looking forward to making another mosaic as part of the campsite’s art program, I eagerly set to work on a picture of a rosella – working on it each morning alongside my mother-in-law. Racing to finish it, I took it back to our campsite to work on it at night. And then because I’d finished it early, I quickly started another picture – pushing myself to finish it before the deadline, when the art teacher was going to help us to grout them. Proudly holding up both mosaics for the obligatory picture (see below), the teacher commented that I was a “typical overachiever”. At first, her comment struck me as a bit mean-spirited. But then I realised: she’s right. 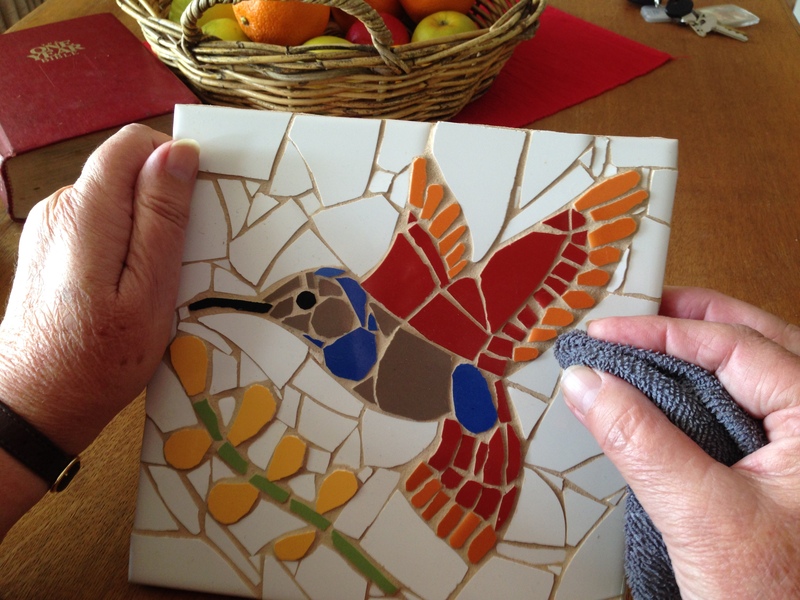 Rather than be happy with the first mosaic I’d done – I had pushed myself to do another one. The activity went from something I’d enjoyed – something that helped me slow down – to something that became a burden. Rather than read my novel, I “had” to work on my mosaic each night in the camp kitchen to get it finished in time. By the end of the second mosaic, my hand had blisters on it from cutting tiles. Looking back, I realise that this compulsion to push myself to do more and achieve more has always been part of my personality. But I can also see that it’s not always a healthy thing. It can turn enjoyable activities into a burden and it can take me away from the joy of just “being” with my family and friends. And this tendency to go overboard – whether its with craft, work or another hobby, is something that becomes even more obvious when I’m hypomanic or manic. Each time I look at my two new mosaics, I hope that I’ll remember this and make more of an effort to slow down and just “be”. Do you have a tendency to become overly “busy” or do you push yourself too hard in some areas? Do you find this gets worse when you’re hypo-manic or manic? We’d all love to hear from you! There’s nothing like smashing a bunch of tiles to get stress out. Which is why one of the things I look forward to most on our annual Summer holiday is creating another mosaic picture. We love to take advantage of Australia’s warm Summer weather by taking the kids camping along the beautiful coastline of New South Wales. One of our favourite spots is a caravan park nestled between a stunning beach and a National Park. It is the perfect spot for us and the kids to relax after a busy year – with lots of outdoor activities and a Kid’s Club every morning. A few years back, while watching our three kids participating in the Kids Club, the teacher asked me if I wanted to join some other parents for a mosaic class that afternoon. I quite like craft, so signed up on the spot – not really knowing what mosaic was or what it involved. Four hours later, I was in my element – smashing tiles with a hammer, smearing glue over them and painstakingly selecting different shards of tile to create a picture. It was slow-going and required concentration… forcing me to ignore the thoughts that had been whirring through my mind, and the stress of the past six months. Ten days later, all those shards of smashed up tile had been transformed into a picture of a beautiful hummingbird, which I proudly took home to give to my mum as a gift. Visiting her this past weekend, I noticed it hanging in her kitchen – and it made me think. In the months leading up to its creation, I had been in the throes of a severe depressive episode. It felt like someone had taken my life and smashed it – breaking me into unrecognisable pieces. Yet, now as I look at that mosaic, I realise that (very slowly) the broken shards of my life have been taken and molded to form a different me. One that is not quite the same, but equally as special. Looking around me at my friends and family, I realise that most of us have been through something that has shattered us. Left us feeling broken and worthless… like a pile of smashed up tiles. Yet, there is a plan in store for us – a plan to use our pain and our hardship to show others that out of brokenness can come something beautiful. Do you enjoy doing crafts? Do they provide you with an outlet to help manage your condition? I’d love to hear about them in the comments below! With charming side-effects like weight gain and hair loss, it’s pretty tempting to stop taking my mood-stabilising medication. Each night, when I pop my pill out of its pack, something within me wants to rebel and throw it down the sink instead. But I never do – for three small reasons. As I write this, they’re sleeping in their beds upstairs. As a mum with young children, I don’t have the luxury of letting my Bipolar Disorder Type 1 go unchecked. While I might quite enjoy the feeling of hypomania – with the surges in creativity and energy and reduced need for sleep – for me this can swiftly lead to an acute manic episode, causing heartache and worry for my family. After experiencing numerous episodes of acute mania and psychosis in my 20’s, staying on my medication and having a good relationship with my Psychiatrist means that I have avoided having an acute manic episode for almost eight years. The last time I was severely unwell was after the birth of my firstborn son – with days of insomnia following his birth culminating in me becoming delusional. None of the midwives at my private maternity hospital knew what to do and sent me home. My son was just six days old and cradled in his Daddy’s arms when l was led out of our house to a Police divvy van waiting outside – the unfortunate mode of transport to psychiatric hospitals for mentally unwell patients in Australia. I worked hard to become well again after that traumatic episode and never want my now almost eight-year-old son to witness his mum being forcibly taken to hospital again. Last year, after a period of extreme stress, I experienced acute depression for the first time. I would find myself crying uncontrollably in the car on the way home from work, only to sit staring at my plate unable to speak during our family dinner. Afterwards, instead of playing with the kids, I would curl up on my bed – while my husband spent hours patiently trying to talk me out of my anxiety. Weekend were no longer a time for relaxation and fun. Instead, I would be lost in my own dark world – dreading the thought of leaving the house to go back to work on Monday. Finally, I realised that what was happening wasn’t normal and went to my Psychiatrist for help. I share this experience because – for me – modern day medicine has been life changing. My medication may cause me to raid the pantry at night. It may have lowered my libido and I may, at times, shed more hair than my pet Golden Retriever. But finding the right medication for me – and staying on it – has also enabled me to live a full, happy life with my family. It meant that I could confidently go on to have two more wonderful children, even after the trauma following my eldest son’s birth. It has given me the confidence to work in my dream job as a Senior Campaign Manager with an international aid organisation. And – as my husband has just kindly pointed out to me – being stable on my medication has also meant that he and my family no longer have to tiptoe around my fluctuating moods, living in fear of another acute manic episode. So when I hold that small yellow pill in the palm of my hand each night, I don’t throw it down the drain and hope for the best. I take it as prescribed, in order to give my children and my family the best of me. Almost twenty years on from being diagnosed with bipolar disorder, I’m getting pretty good at knowing the signs my mind and body display when they’ve been pushed to the limit. Not being able to stop thinking about work even after I come home at night, a tight feeling in my chest and being so focused on my “to do” list that it’s 5pm before I realise I’ve skipped my lunch-break. It’s usually around this time that I have to force myself to slow down and – if I can wrangle a meeting-free day – perhaps even take a “mental health day”. Only I don’t ever admit to my manager that it’s a mental health day. It’s an “upset stomach” or a “sore throat” or some other common ailment. With World Mental Health Day coming up on 10 October, I’ve been thinking about this – and wondering why I have never ever admitted to taking a “mental health day”. It’s not because I’m not allowed to. In fact, it’s clearly stated in my employee handbook that taking a mental health day is a perfectly ok use of a sick day. Flu is catchy and noone wants to share officespace with someone who has an annoying, hacking cough. But stress or anxiety isn’t visible. Noone can see the tight feeling in my chest or the way my mind won’t stop racing. Only I know that this is happening and it’s easy to put on a brave face when I’m at work. As someone with Bipolar Disorder, I have a perfectly good reason to take a “mental health day” if I need one. In fact, if it helps keep me healthy and functioning well, it’s actually a good thing. Much better to take a day to nip stress and anxiety in the bud than let it manifest a few weeks down the track in an episode requiring medication and professional care. Still – when push comes to shove, I’d rather admit to being physically unwell than admit that I need a quiet, stress-free day at home. Noone – I repeat noone – wants the person who is responsible for your future promotions, pay rises and performance reviews thinking that you are mentally unstable. I don’t have a problem sharing about my mental illness with friends, family, church groups, readers of this blog, my Twitter followers… yet I draw the line at sharing about it with my direct manager. I don’t want my work performance to be judged on anything except… well, my work performance. Yes, I have Bipolar Disorder, but for 99% of the time, it doesn’t affect what I do at work. In fact, I’ve had less sick days in the past year than most of my team members. I don’t want my manager wondering if I can handle a big project – or whether I’ll be able to cope with a management role. I’m a loyal, hard-working employee – and that’s all I want to be judged on. I’ll be the first to admit it, the thought of others knowing you have a mental illness is embarrassing. While organisations like Beyond Blue and The Black Dog Institute have done a great job in raising awareness of illnesses such as depression in the past few years, not many people are aware of other types of mental illness – like mania or psychosis. Usually the first reaction people have when I tell them I have a mental illness is to say “Oh, so you have postnatal depression?” Considering my youngest is now almost four years old, I find this a bit odd. But I understand that this is one of the few mental illnesses that people feel comfortable discussing. When I mention that I have only ever once had a depressive episode – but that stress can lead to my mood doing the opposite, becoming manic – they look a bit confused and then quickly change topics. Rarely has anyone actually asked me what I’ve experienced during an an actute manic epsidode or psychosis. Maybe it’s because the word psychotic has the word “psycho” in it … but in any case, people are still a bit put off when the conversation heads in that direction. With this in mind, I’d rather not have to explain the difference between depression and mania when I call in for a sick day. So there you have it. Three reasons why someone who has a recognised mental illness and is passionate about mental health advocacy admits to never taking an official “mental health day”. With Australia focused on mental health this week, I hope that this is a stark reminder why we need to keep working together to stop the stigma of mental illness and to make looking after one’s mental – as well as physical – health, a perfectly acceptable reason for taking a much-needed day off work. Are you ok with taking a “mental health day” when you need it? Check out this website and make a promise to yourself to look after your mental health. It’s not everyday that a colleague drops the ‘b’ bomb – revealing that they have bipolar disorder. In fact, in the fourteen years since I started work… it’s never happened – until earlier this month. As many of you know, I have the enormous privilege of working at a charity helping people living in poverty. Earlier this year, a talented young man joined our team. Fresh out of University, he quickly gained a reputation for showing extraordinary initiative and producing high quality work. One morning, chatting casually over a coffee with him and another colleague (who I know has struggled with depression) – I told them about this blog, and my passion for de-stigmatising mental illness. Then, out of the blue, my young workmate quietly said “I have Bipolar too”. Stunned, I made some lame comment and eventually the conversation gradually drifted to another topic. Driving home that night I decided I would take him out for a coffee the next day and chat about what he’d said – even offer some support if he needed it. This is different from saying that your life is over. You can still go on to live life to the full. I have. But life as you know it is over. You have a serious illness and you need to take it seriously. You need to take care of yourself. If you do, you may no longer experience the euphoria of mania but you’ll also no longer go through debilitating depression. Life may seem a little more boring. But you’ll be able to hold down a job and your loved ones will be spared the drama that is life with someone yet to be diagnosed as having bipolar. The key here is to listen to them. My psychiatrist says the hardest part of her job is trying to convince people that a) they have bipolar disorder and b) to stay on their medication. It’s easy to take your medication when you’re in the depths of depression. It’s much harder to stay on it when life seems rosy – and you start to doubt you actually have a mental illness. I had a nurse friend once comment to me that ‘you seem fine to me… maybe you shouldn’t be taking so much medication’. I told her that she should have seen me when I was in the high dependency ward of the local hospital’s psychiatric ward. The truth is that my daily does of medication is what enables me to live a full, happy life. I’ve learnt the hard way that stress and lack of sleep are a bad combination for me. 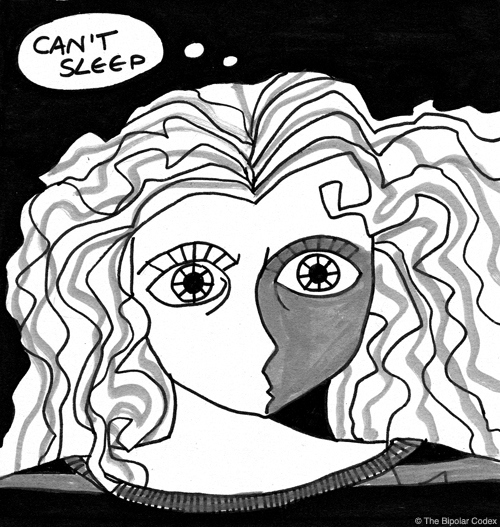 A bad dose of insomnia can quickly turn into a manic episode and – within days – psychosis. Now, I never go without sleep. For the rare night when my Seroquel isn’t enough to bring on sleep, I don’t let the clock tick past 1am without taking some other measure – like a sleeping tablet. I always let my husband know that I’m having trouble sleeping and that I’m taking something or it. That way, he can be on alert to make sure my symptoms aren’t getting out of control. Stress is a little more difficult to keep in check. By nature, I’m the type of person who likes to keep busy. I’ve noticed at work that you’re the same. It’s hard to say “no” when there are so many great things to get involve in, events to attend and friends and family to catch up with. But one of the best things you can do for yourself is give yourself time to unwind, rest and relax. For me, this means hardly ever scheduling things at night, after dinner. Find out what level of stress you can handle and put boundaries around your “down time”. It’s worth it. It’s embarrassing to tell people that you have bipolar disorder. I spent hours deliberating if I should declare my condition on my human resources form for my new job. And I certainly pick and choose who I tell about my condition. That said, you owe it to yourself and your partner to tell at least a handful of close friends and family about your condition. In the event you become unwell, you need people who love and care for you to be able to recognise the symptoms and get you help. It’s not enough to just rely on your partner.. if you’re seriously unwell they may be in denial or not able to convince you to get help. Get a support network around you. One of the best things I did almost six years ago, was to write a Bipolar Action Plan. This outlines your condition, contact details for your GP and Psychiatrist, preferred hospitals and those you want to avoid, what your triggers are and what medication you are on now and what has worked in the past. I’ve personalised mine with details of what types of things that make my episodes worse or what seems to help. Because I have little children, I have included instructions for who I want looking after them and a list of people who can provide other support like meals. You don’t have kids yet, but you might like to include notes on what you want told to your manager at work or friends. You may feel like this isn’t necessary. But for me, having this down in writing somehow lessened my anxiety and gave me a sense of control over what would happen in the event I became unwell. So there you have it! Five things I would have told my workmate if I had invited him for coffee. Now that they’re down on paper (or at least on my screen), they really don’t look that daunting. Maybe this week I’ll finally get the guts to share them in person. Less than a week ago, I underwent eye surgery to remove a cataract I’d had since birth in my right eye. In the lead up to the surgery, I was completely focused on the risks associated with the surgery: that I’d end up with no sight at all in my right eye or – even worse – that my ‘good’ left eye would be damaged. Despite there only being a 1% chance of being left blind, this was enough to have me freaked out. What if I never saw my children or husband again? What if I had to give up a job I loved to stay at home – blind? What if I had to live in a bleak, dark world for the rest of my life? I got so caught up worrying about the surgery, that I completely forgot to hope – or pray – for a miracle. When friends and family told me they were praying for my eye to be healed, I told them my surgeon said it was impossible to get sight back in that eye. Apparently if you can’t see out of one eye for long enough, your brain ‘switches off’ sight to that eye. And yet, a miracle is exactly what I got. To the surgeon’s surprise, when my bandages were removed I could see out of my right eye for the first time ever! Five days later, I’m still in shock that I’m no longer blind in one eye. This ‘miracle’ got me thinking… since I was diagnosed with bipolar disorder, have I ever really believed that one day I could be healed of it? I’m not talking about stopping my medication to follow some unproven theory. But what if – in the years ahead – researchers somewhere discover the cause behind bipolar disorder or a permanent ‘cure’ for the condition? Like my attitude before my eye surgery, I’ve never allowed myself to even think of what it would be like to be cured of bipolar disorder. No longer having to rely on daily medication, with annoying side-effects. No longer at risk of going too ‘high’ or ‘low’. No longer having to declare my condition on insurance or work forms. And – most importantly – no longer having to worry if I will pass this condition on to my children. When you’ve lived with a condition for a long time, you tend to resign yourself to the fact that you’re always going to have it. I know I never expected to see out of my right eye again. 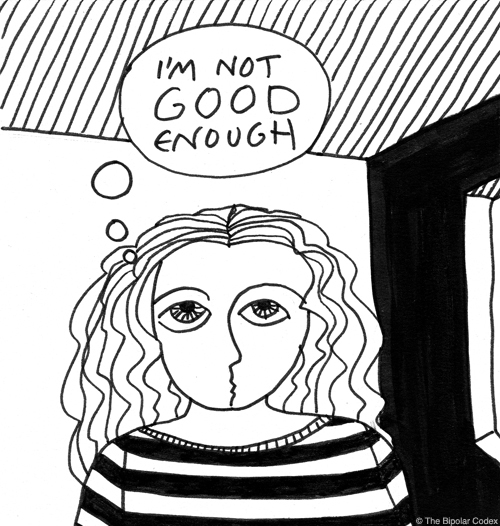 If I’m honest – I don’t expect to ever be ‘cured’ of bipolar disorder. And yet, it’s important to keep hoping for a cure… to keep urging the medical community to continue looking for answers and to keep praying for a miracle for the hundreds of thousands of people impacted by this condition. Life’s a game, you’re the quarterback. Despite being Aussies, our household is in the grip of NFL fever at the moment. My husband, who spent part of his childhood in St Louis, Missouri, has passed his love of the sport on to our three kids. Even our four year old daughter – who is as girly as they come – can recognise all 32 teams in the NFL, by the logos on their helmets. This week, while watching Sunday night football (which for us in on a Monday), my six-year-old son explained what the ‘end zone’ was to me. Basically – for those of us from Australia – this is where the team needs to get the ball to score a touchdown. Notice the key word here: team. Unlike Aussie Rules Football, NFL teams have a LOT of players. Each of the 53 players has a distinct role and responsibilities – linebacker, quarterback, wide receiver and so on. At the heart of each team is the coach – responsible for designing ‘plays’ (strategies to help the team get the ball to the ‘end zone’). Players work hard to memorise huge folders full of different ‘plays’ before they are called out. If they don’t, they risk not only embarrassment but serious injury. Watching the Panthers vs Patriots this week, my mind drifted and I started to think of myself (as someone with bipolar disorder) as a quarterback and my support network as my team. At the helm is my psychiatrist – acting like my coach and working to map out ‘plays’ or an action plan that will see me get into the ‘end zone’ (a.k.a stay well). As quarterback, I’m usually in control of what happens around me – giving directions and communicating well with my team. However, in the event I become unwell, I need to rely on my teammates to rally around me, and my coach to step in and call a ‘time out’ (possibly in the form of increased medication or a hospital stay). Although it might cause initial angst, no player would begrudge his coach for putting him on the bench if he was injured. Unlike us tough Aussies – who play with only a mouthguard – no quarterback would go out on the field without his helmet and padding. So too, I don’t go without my daily preventative medication, that protects my most precious asset (my brain) and keeps my bipolar disorder in check. So there you have it…. the MOST unsporty woman on the face of the earth has just written a blog comparing herself to a quarterback. I can’t wait to see my husband’s face when he reads this! Are you surrounded by a good team? Do you follow the strategies or action plan set out by your psychiatrist? I’d love to read your comments! 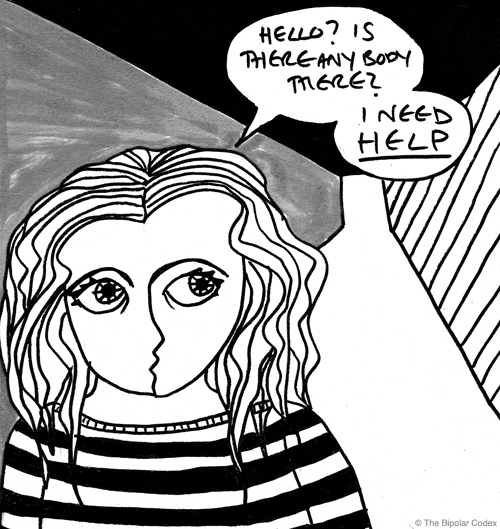 Tonight, browsing the internet, I came across a wonderful blog, with incredible images drawn by someone with bipolar disorder. Somehow, with a simple image or two and very few words, the blog’s author managed to conjure up some of the emotions that many of us go through. And so, in the spirit of her blog – I’m going to say no more and simply show you some of her pictures. If you’d like to see more, I’d encourage you to take the time to visit her blog. Thank you to http://bipolarcodex.wordpress.com/ for sharing these photos with us.